You will be place on our priority queue if you apply for your 2013 (and later years) tax refunds now; after the end of March 2018, it will be impossible for anyone to help you claim your 2013 tax refunds back! Not even Inland Revenue will help you as this marks the end of New Zealand's financial year. 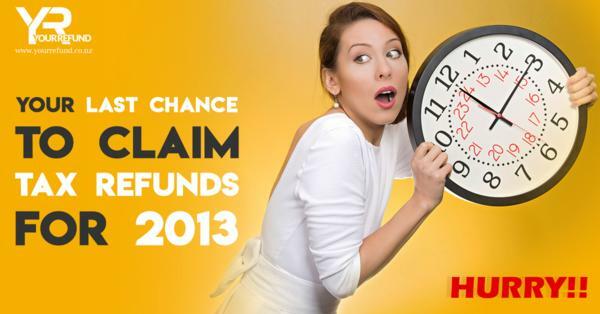 Our staff at Your Refund are waiting to help you file for your tax refunds and tax returns! Your benefits? NO minimum fee. NO ID verification fee. NO fee if no tax refunds are due. All you need? Contact & other details, a valid Photo ID (Driving Licence/18+ Card/Passport/etc), and your IRD number (optional). No credit card information required! Know the differences between a tax year and a calendar year - visit us to check it out. As an individual taxpayer, the tax year you should be concerned about is the company and personal financial year which begins on 1st April and ends on 31st March (the following year - same for this year as well). Why? Because it is ultimately relevant to your tax returns. You should begin applying for your tax refunds before it is too late!